A few weeks ago, I went to visit a friend of mine, Eric, who lives in Western Mass. Thanks to, Foursquare checkins, I knew several of his “local haunts”. One of them was Fitzwilly’s Restaurant, so on the night that I arrived, he, his friend Trey, and I enjoyed a late dinner at this fun bar/restaurant. After a little bit of friendly banter, I asked our server, Sean, to pick something from the menu for me and to surprise me. He was such a good-natured guy and didn’t skip a beat. Eric got Buffalo chicken Mac ‘n Cheese (sounds delish! ), Trey ordered a burger, if I recall correctly (and I may not! ), and I ordered up a surprise. This is what Sean brought me. A delicious turkey sandwich with a surprising taste of cinnamon apple, cheddar cheese and honey mustard. It was way too much to finish during a late dinner, but it was also excellent as a cold leftover the next afternoon. At one point, Sean had asked me if it was the best sandwich I’d ever had, and while I’m not sure I could go THAT far, it was a darned good sandwich! I certainly recommend it if you’re in Northampton, MA. I also recommend dining with Eric and Trey – they’re fun guys! Yeah, that sandwich sounds delicious. 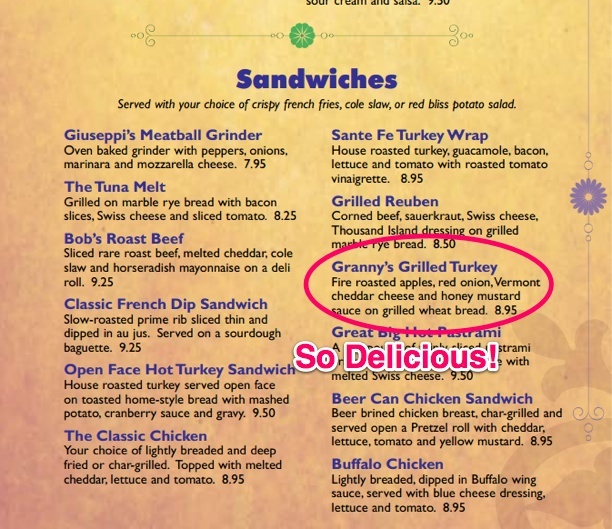 Fire roasted apples?! Holy crap, do I need to start adding these to my sandwiches. Seriously, it was a delicious surprise! I recommend adding them anytime! Oh, and love your roller-derby badass persona. I’ve been to the Derby here in Detroit, and it’s awesome. A good friend is turning all Derby badass too! Rock it, girl! people interested about what you’ve written. In my opinion, it might make your blog a little livelier. Thanks for your comment. I acknowledge that some of the titles are rather straight-forward and not very intriguing. Some are easier than others to “dress up”, and hopefully I’ve gooten better with that over time (this was a pretty early post). I do appreciate your feedback!